How does someone like/know/follow a band for 20 years and NOT totally get it — until last night, their sixth-to-last show, my penultimate Black 47 show? Didn’t know how necessary it was to see them last night at Paddy Reilly’s. I’ve seen them at least a couple dozen times at nightclubs, at fairs, at Irish clubs and, once, an amphitheater in Hollywood. But I never saw them in their true element until last night. Never saw them at Reilly’s. Yeah, I know, there was that bar up on Bainbridge Avenue in the Bronx where they cut their baby teeth, and the original Reilly’s, when they first achieved fame, was a block south on Second Avenue, but nonetheless, it was Black 47. 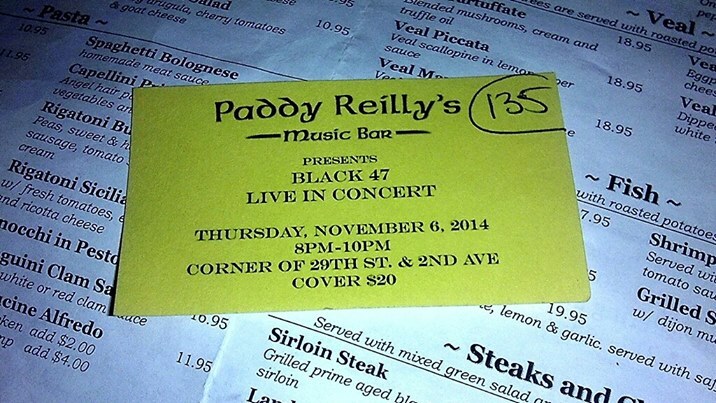 It was Reilly’s, their last hurrah there. And a week from tomorrow night, on the 15th, when they play their final note at B.B. King’s, everything truly, sadly, will be one huge was.